The Mazda Vision Coupe was awarded the “Most Beautiful Concept Car of the Year” at the 33rd Festival Automobile International. 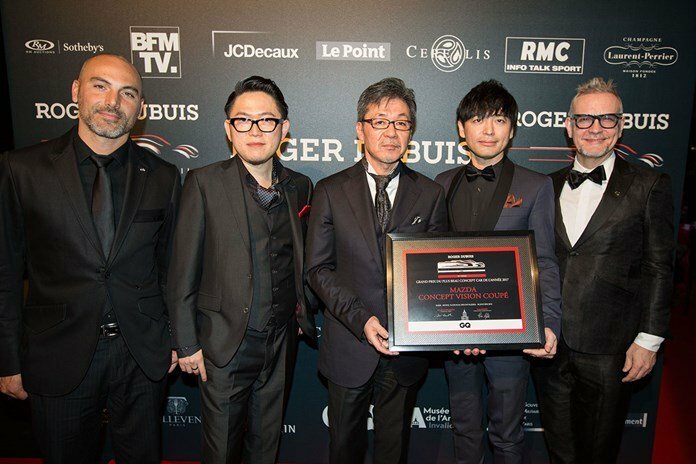 Mazda’s global design director Ikuo Maeda and his team of designers attended the festival, held in Paris, France to accept award. The vision coupe was initially revealed last October at the Tokyo Motor show, where its study design, implementing the KODO: Soul of Motion Design Language stole the show. The fact that two years ago Mazda’s rotary inspired RX-Vision won the same award is a true testament to how engaging and refined Mazda’s design language has become as it has evolved throughout the years. The jury consisting of not only automobile experts but renowned architects and designers, chose the Vision Coupe over nine other nominees which included: the Audi Aicon, BMW i Vision Dynamics, Kia Proceed Concept, Lamborghini Terzo Millennio, Mercedes-Benz AMG GT Concept, Mercedes-AMG Project One, Vision Mercedes Maybach 6 Cabriolet, Nissan Vmotion and Peugeot Instinct. Most concept cars tend to have complex, rather out-of-this world designs but Mazda’s concepts tend to be more simple and elegant. The exterior’s simple “one-motion” form expresses a formidable sense of speed. The interior, meanwhile, borrows a concept from traditional Japanese architecture to create a degree of three-dimensional depth conducive to a relaxed space. Finally, the name pays homage to the company’s 50-plus year tradition of elegant coupés like the Mazda Luce Rotary, also known as the Mazda R130. All of these elements come to together to create a concept that is striking, refined and critically acclaimed as the most beautiful concept car in the world.